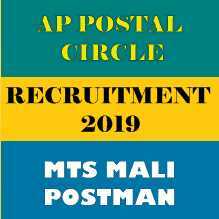 AP Postal Circle Recruitment 2019 AP Postal Circle Online Form 2019 Andhra Postal Circle Recruitment Notification for Multi-Tasking Staff AP Postal Circle Job alert 2019 MTS, Mali, Postman Recruitment 2019 in Andhra Pradesh Andhra Pradesh Postal Circle has invited online applications from the eligible candidates to fill the posts Multi-Tasking Staff. Candidates who meet the eligibility criteria can apply through online mode. AP Postal Circle MTS Recruitment 2019: Online applications are invited from the eligible candidates to fill up the posts of Multi-Tasking Staff, Mali & Postman in the following circle and Administrative offices, Postal Divisions/RMs Divisions in Andhra Pradesh Postal Circle in the pay scale of Rs. 18000/- in level-1 pay matrix as per 7th CPC + admissible allowance as prescribed from time to time. For other details such age limit, educational qualification, salary, and selection process read the complete notification given below. Dear applicant, through this article, we have tried to provide all necessary important regarding the AP Postal Circle MTS Online Form 2019. Therefore, we Have advised the candidates to read the notification before filling the application form.